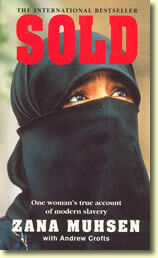 The true story of Zana Muhsen’s years as an enforced child bride in the Yemen. France’s biggest non-fiction seller in 1992, it has sold threemillion copies in Europe. Condensed by Reader’s Digest and dramatised for Radio 4, the British paperback edition reprints regularly. in Yemen, only discovering the truth once they got there. ready to talk. She needed time to reflect and to put her ordeal into perspective. to produce a true picture of Zana’s story. younger brother Abdullah arrived up the same path that we had first climbed. a restaurant in Campais, which was next to the main road out to Sana’a. Abdullah had been helping his father to fix it up in preparation for opening. much notice. I knew he was fourteen, but he looked more like ten to me. her specially protective towards him. at the floor, saying nothing. or not. ‘What?’ I asked. the words he was saying, unable to believe that I was hearing them right. what I was hearing. I felt short of breath and panic-stricken. 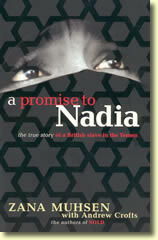 A follow-up book to Sold, telling of the continued fight to save Zana’s sister Nadia. ten years later, I am trapped once more. upon them in the eyes of the world. and abuse us and make us fear for our lives and the lives of our children. from England. It’s a small car and we’re all crushed in like sardines. OMG! They got their happy ending. That is so amazing. I just finished Sold and I was looking for Zana’s contact details. There is no need now. I would just like to say this was an inspirational read. I’m always looking for something to give me hope and this book did just that. I was deeply moved by the book Sold, thank you so much for spreading the word about this heinous activity shattering so many innocent lives. There much speculation on the web about whether Nadia has really returned to England to be with her family and friends as so many lies were spun by the governments involved. Would it be possible for upload a recent photo or video of Nadia with Zana and their children as evidence that all efforts were not in vain? Really hope to hear from you soon with good news! Thanks for your enquiry. You will be pleased to know that Nadia and the children are now safely in the UK. Marcus came looking for his mother as soon as he turned 18, just as Zana always hoped he would. Thank you for caring enough to write.